Pensacola Yacht Club. Adults will be in the ballrooms. Children ages K and up will have dinner and be entertained upstairs in the Lighthouse Room. Professional supervision will be provided. 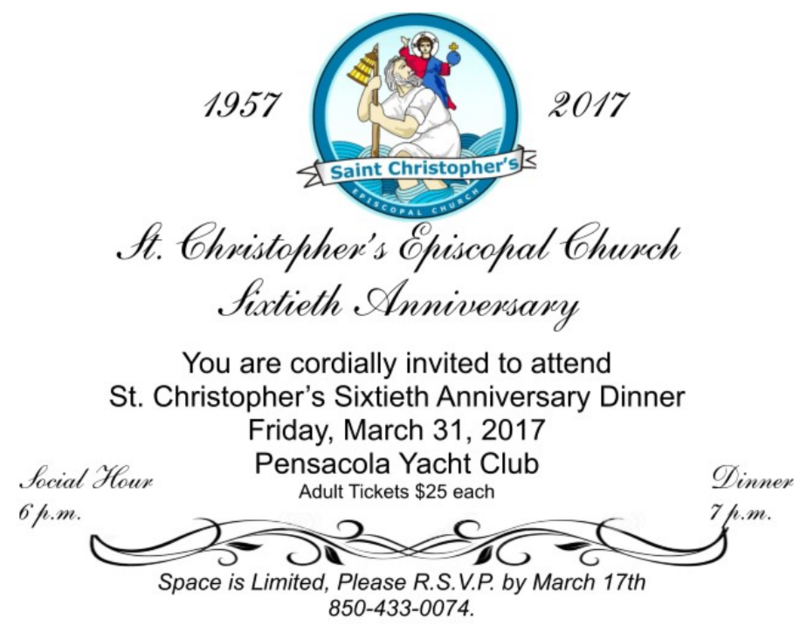 Adults - Mixed Green Salad with choice of dressing, Blackened Chicken Breast with Crawfish Cream Sauce, Pecan Crusted Grouper with Citrus Butter Sauce, Rosemary Mashed Potatoes, Vegetable Medley, Rolls and Butter, Coffee, Tea and Water, Anniversary Cake. Children - Chicken Fingers, French Fries, Fresh Fruit, Lemonade, Water and Cookies. Some great story telling and other surprises. Tickets available after both services on Sundays. Check, cash, Master Card, or Visa accepted. Office Monday through Thursday 8:00 AM until 3:30 PM. Pay by check only. Carpooling will be provided from the church. Please indicate when you purchase your ticket if you will need transportation.